Robot Sensor Market size was estimated at over USD 2 billion in 2017 growing at a CAGR of over 12% from 2018 to 2024. The global shipments are forecast to reach over 12 million units by 2024. Robot sensor market size is anticipated to grow due to the high demand in industrial robots. With the continuously evolving sensor technologies, industrial robots and service robots are witnessing enormous enhancements and upgrades. For instance, FANUC sanding robots are being integrated with force sensors and machine vision sensors to increase the productivity of robots in manufacturing. Manufacturing industries are deploying robots at an exponential rate in their facilities to reduce the operational costs and increase their profit margins. Companies are upgrading the robotic arms and are integrating them with sensors for more efficient production in the facilities driving the robotics sensor market growth. Industrial robots perform activities such as arc welding, spot welding, machine tending, polishing, and materials handling. The increasing applications of industrial robots are further propelling the demand for advanced sensors as they improve the system performance and enable smart factory operations more independently and safely. The solutions suitable for a robot depends highly on the type of robot and its applications. Factors, such as high initial investments and the complexity associated with programming of the robots, are limiting the growth of the robot sensor market. Moreover, the lack of integration in the majority of industrial robots that run on programmable software is hindering the adoption rates in industries that have monetary restraints. 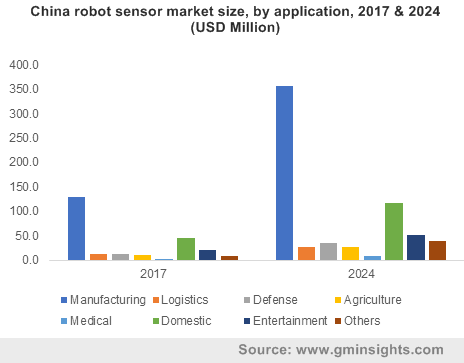 Lack of awareness about the capabilities that sensors impart to robots in the emerging economies coupled with the safety concerns associated with the failure of the components is limiting the robot sensor market growth. The vision sensors in the robot sensor market is expected to grow at a CAGR of over 12.5% from 2018 to 2024, which is due to the higher integration of these sensors into industrial and collaborative robots for pick and place applications. These components enable identifying objects, navigation, and obstacle detection as they are integrated with technologies including 2D camera, 3D camera, and CMOS. 2D vision sensor technology is predominant owing to its low cost. However, technologies such as 3D vision stereo cameras and CMOS image sensors, are also being adopted, propelling the demand for vision robot sensor market. Recently, ams AG introduced a new CMOS image sensor with higher resolution that enables robots the ability to create real-time three-dimensional maps of their surroundings. This 3D imaging enables the robots to operate and move with increased precision and safety, avoid obstacles in their path and to perform their primary tasks better such as picking up and moving objects. Laser range scanners in the robotics sensor market, such as the LiDAR sensor, are also gaining popularity; however, their adoption is slow owing to their high cost. There are several companies working meticulously to produce lower cost LiDAR solutions. The collaborative robots segment in the robot sensor market is projected to grow substantially to reach over USD 600 million by 2024. Collaborative robots require more sensors as they need to have more awareness of their environment to work efficiently alongside humans. The industrial shift toward the system is furthermore augmenting industry growth. This growing shift is attributed to the features such as lesser weight and cost-effectiveness of collaborative systems compared to the bulky industrial robots. This drives the demand for more of such components to automate tasks while ensuring safety. For instance, the demand for force-torque sensors in collaborative robots has spurred as they enable surface finishing tasks and assembly tasks with high precision. Force-torque sensors enables a system to perform force-sensitive tasks. They were integrated into robotic arms before; however, nowadays they are being integrated into other parts of robots including torso. The manufacturing industry holds the majority revenue share for the robot sensor market and is projected to grow at a CAGR of over 13% from 2018 to 2024. The growing demand for automated systems in the manufacturing sector is increasing the industry demand in industries such as automotive. In the automotive sector demand for force-torque sensors and vision sensors for increasing as they enhance the efficiency of tasks such as pick & place and assembly. Automobile manufacturers are deploying robots at a much faster rate for applications such as arc welding, spot welding, and dispensing. According to the Robotics Industrial Association, the automotive sector held around 35% of the industrial robot sales in 2016, followed by the life science industry and electronics industry with 20% and 17% respectively. This appears to be promising for the future perspectives of the robot sensor market. North America dominates the robot sensor market owing to the increasing adoption of robots across various industries. According to World Robotics 2017, around 242 service robot manufacturers are present in the U.S. and the industrial robots are being deployed at an exponential rate in the U.S. The U.S. robot sensor market is expected to reach over USD 1.7 billion by 2024. In the first quarter of 2017, robots worth USD 516 million were ordered from North American robotics companies. The U.S. military is also investing in combat robot warriors under the U.S. Defense Advanced Research Projects Agency (DARPA) in 2016. The U.S. is also one of the top 10 countries with the highest robot density globally. 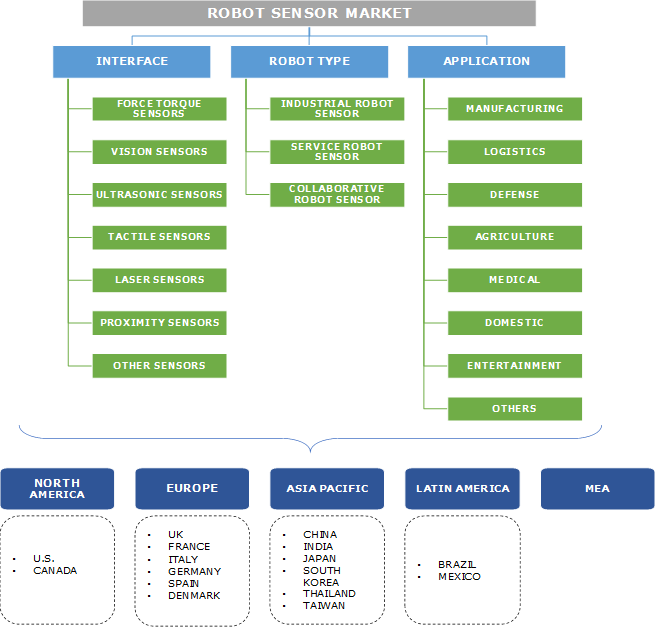 Asia Pacific robotics sensor market is estimated to be the fastest growing market owing to the increasing demand from countries including South Korea, China, and Japan. The Asia Pacific region dominates the industrial robots market with major volume sales of global industrial robots from countries such as China, the Republic of Korea, and Japan. The manufacturers in the region are offering solutions to end users based on applications for enhanced operations fueling robotics sensor market growth. The global robot sensor market is diverse with several semiconductor companies offering sensors for robots. Major companies that offer their sensors in the industry are SICK AG, Baumer Group, Cognex, IFM electronic GmBH, ams AG, ATI Automation, Rockwell Automation, Velodyne, and Baluff AG. Companies in the robotics sensor market are offering low-cost solutions to gain a competitive edge over other competitors. In September 2017, ATI Automation launched Axia80 in its force-torque sensor product line at a comparative low cost. Moreover, LiDAR sensors are highly expensive in the range of USD 1,000 for 10 meters or less to USD 10,000 from Velodyne. In 2016, a California based start-up called Scanse developed a USD250 LiDAR outdoor sensor with a range of 40 meters for commercial robot developers. LiDAR are being extensively used in commercial or industrial mobile robot in operation or under development today. In 2016, Epson launched force sensors valued at USD 7,200 that can be integrated with Epson robots that can be used in the agricultural and manufacturing industries. The declining cost of sensors have propelled the robot sensor market. The prices are declining at a modest rate due to the advancements in semiconductor technologies, leading to a drop of per unit cost of sensors. Industrial robot manufacturers are integrating more novel sensor technologies for making them efficient. The development of tactile intelligence in automated systems is furthermore driving the demand for vision and force-torque sensors. Recently, these components were integrated with more specialized robots, such as the service and collaborative robots, that require higher data collection for their operation. However, the industry shift toward automation 4.0 is driving manufacturers to integrate specialized sensors in industrial robots and robotic arms for more efficiency and productivity. In 2016, robot manufacturers sold around 300,000 industrial robots valued at USD 12 billion. Service robots worth USD 5 billion were sold globally with unit shipments around 150,000. The deployment of collaborative robots is also increasing, spurring the robot sensor market.